ARLINGTON, TX – The words one might have used to describe the weather conditions outside of the College Park Center tonight could also be the same words used to describe the recent play of the WNBA team that currently are tenants inside of the building: hot, and uncomfortable for visitors. 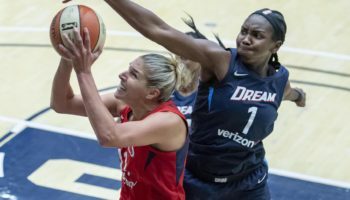 The backcourt of Skylar Diggins-Smith and rookie Allisha Gray combined for 41 points as the Wings’ stellar play continued with a 94-84 victory over the Atlanta Dream on Wednesday night, Dallas’s fifth win in its last six contests. The win climbed the Wings back to the .500 mark at 9-9. Dallas never trailed in the game, scoring 31 first-quarter points and opening up a 16-point lead by halftime at 52-36. That lead ballooned to as much as 23 midway through the third period before a furious Atlanta rally pared its deficit to only four with just under 90 seconds remaining. Gray answered the Dream’s run with four-point play with 1:14 left to ice the game for the Wings. 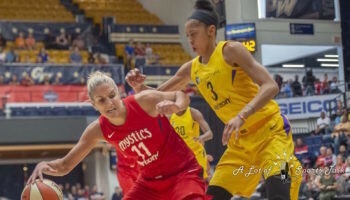 Diggins-Smith, the Wings’ leading scorer on the year, led the way with 21 points while also adding seven assists, five rebounds and three blocked shots. 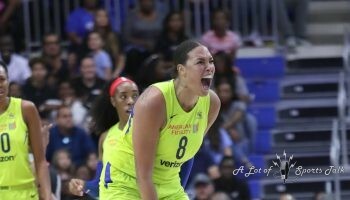 While pleased with the team’s performance overall, she did also acknowledge leaving the door open for Atlanta and improving on that front going forward. Her backcourt mate, Gray, made sure to close the door on the Dream’s hopes of a miraculous come-from-behind win late. 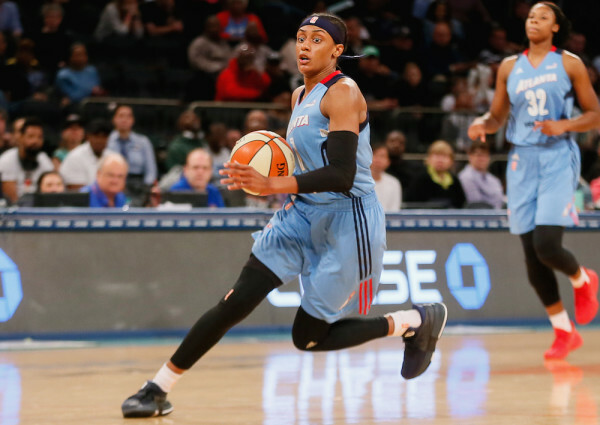 Named the WNBA Rookie of the Month for June – and for a second consecutive month – just hours earlier, Gray received a crosscourt pass from Diggins-Smith and drilled a contested three while being fouled by Dream guard Layshia Clarendon, resulting in a four-point play and a 90-82 Dallas cushion heading into the final minute of play. 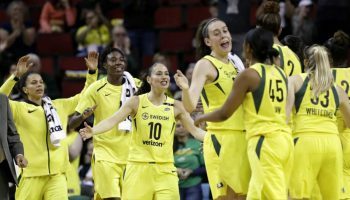 Gray, the fourth overall selection in the 2017 WNBA Draft out of South Carolina, ended the night with a career-high 20 points. Atlanta also had a rookie have a standout performance, as Syracuse product Brittney Sykes scored 15 points while playing a big part in Atlanta’s comeback. Immediately preceding Gray’s four-point play, Sykes hit a step-back three in transition with 1:28 remaining to cut Dallas’ lead down to four at 86-82. Playing just over 16 minutes per game, Sykes is averaging eight points in her rookie season, with tonight marking only her third start of the campaign. 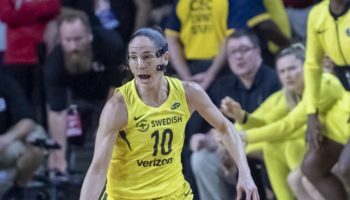 Her relentless style of play, and ability to be a leader on the floor, however, may call for a more permanent place in Atlanta’s starting five. Tiffany Hayes led all Atlanta players with 16 points.